Chinese forces drive Japanese out of Nanning, China. Parts of the Australian 8th Division arrive in Singapore. In the wake of the Stalingrad disaster, Dr. Goebbels, speaking before an enthusiastic audience of soldiers and civilians in Berlin, announces the implementation of “total war” which, for the first time, mandates the employment of German women in the war effort. 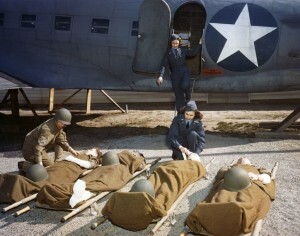 The first class of 39 flight nurses graduates at Bowman Field, Kentucky. Nazis arrest the ringleaders of the White Rose resistance group at the University of Munich. German General Erwin Rommel takes three towns in Tunisia, North Africa. Mosquitoes, escorted by Typhoon fighter-bombers, launch a daylight low-level attack on the prison at Amiens, France, in order release French patriots; 258 prisoners escaped (including many criminals), but 102 inmates were killed. Renewed allied attacks at Cassino are broken off. The Germans make further gains at Anzio but are repulsed by allied artillery and warships. The Red Army recaptures Staraya Russa, as Army Group North falls back to the line Narva-Pleskau-Oposhka. The Germans conduct their heaviest night raid on London since 1941 as the Luftwaffe intensifies the ‘Little Blitz’. The Cruiser Penelope is sunk by U-410 off Naples and earns the distinction of being the last British cruiser to be lost in the war. 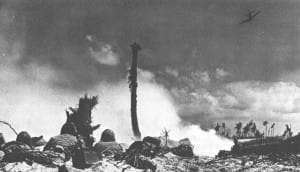 U.S. Marines begin landing on Eniwetok Atoll in the Marshall Islands. The Red Army encircles Graudenz on the Vistula. Troops of the 11th SS Army are brought to a stand still by stiffening Soviet resistance to ‘Operation Sonnenwende’. A Russian torpedo hits the ex-’Strength through Joy’ Nazi cruise liner leaving Danzig for Denmark with 5,000 refugees and 3,800 U-boat personnel on board. Only 1,000 are reported as saved. British Empire casualties to November 1944 are announced as 282,162 killed, 80,580 missing, 386,374 wounded and 294,438 captured. US Army Air Forces Band (under Maj. Glenn Miller before his death) performs at Paris Opera House, the first time popular music was performed at this venue.